I’m a biiiiig fan of Paul Davies‘ books. Even though his style is bone dry, he manages to pack in more “Holy Crap, what a cool idea!” moments per chapter than just about any other author. Davies will spend a couple matter-of-fact pages exploring some fascinating idea that other authors would stretch out to an entire book. This book (one of many authored by Davies) covers an unquestionably cool topic — the search for extraterrestrial life, or SETI. 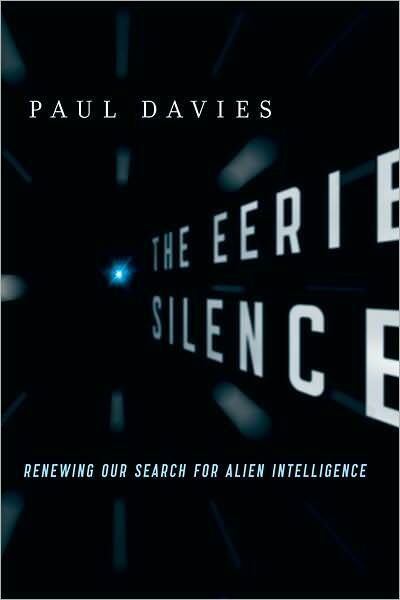 Davies spends almost no time covering the traditional topics surrounding ET (such as UFO sightings, Area 51, etc.) — this is a book focused on the hard-nosed science about communicating with aliens, if they exist. With particular emphasis on “If They Exist”. You hear a lot of scientists remark about how alien life in the universe must be commonplace. There are so many planets out there, that just the statistical odds alone should be overwhelmingly in favor of other intelligent life, right? Seems plausible, but then… WHERE THE HELL ARE THEY? Because it really has been absolutely silent out there, as far as we can tell. Aside from UFO sightings and abduction reports (which Davies dismisses as lacking any credible evidence), and aside from a couple of tantalizing (but never-confirmed) extraterrestrial signals, we’ve heard jack squat from our neighbors in space. But why? It should be obvious that *somebody* up there ought to be technologically advanced enough to send us a signal. Don’t make the amateur mistake of assuming that aliens are just now developing interstellar communication technology, like us — chances are, if they exist at all, then they’re millions of years older than us. Once that fact dawns on you, you quickly wonder where the hell are they, and why they haven’t left behind an obvious mark of their presence on the universe. No interstellar “interstate” transport system? No galaxy-spanning radio stations, pumping out the hits? Not even any Vogons? This question was famously posed by the eminent physicist Enrico Fermi, in what is now known as the “Fermi Paradox“. The paradox in a nutshell: there’s been plenty of time since the creation of the universe for other civilizations to get up and running, develop interstellar travel, and to have stopped by to visit by now. Where is everyone? (A similar paradox about time travel — if time travel were possible, then where are all the tourists from 3410 A.D. checking us out?) Davies’ somewhat bad news is that despite the compelling statistics, we just don’t know whether alien life exists — there just isn’t enough information yet known to make a call. We just have no idea how hard it is for life to spark up, once a suitable location is formed. No idea. There probably are plenty of suitable planets out there, but we haven’t a clue whether life easily flares up on a reasonable planet, or if almost all of these Edens-in-waiting remain barren. For the astro buffs among you, Davies is pointing out that the famous Drake Equation (that attempts to estimate how many inhabited worlds exist out there) has error bars so large that it is essentially useless. So how would you even get a handle on estimating the unknown parameters? For example, how would you estimate the likelihood of life forming, on a typical planet? We’ve only got one positive example to go on — sure would be nice to have some more examples to build up our sample size. Finding alien life would solve that issue, but of course that’s the original damn goal in the first place — if we could find at least one more example of life in the universe, who gives a crap about the Drake equation? Pop the champagne! Is there any way to shore up some of the estimates in the Drake equation without the extremely hard step of finding alien life? Davies has a suggestion — a very cool suggestion, I might add. What if we looked on our own planet, to see if life has sparked to life more than once? If there have been multiple independent genesis-es (yes, that’s the plural of “Genesis”) on our own planet, then we’d know a little bit more about how easy it is for life to spring up anew. As far as we can tell, all life we know about on Earth has descended from the exact same Genesis event. Go back far enough, and we all came from the same puddle of primordial soup. Can we find any evidence of life on earth that arose from a completely different Genesis? Could that life still be around today, coexisting with life as we know it? Davies puts forth suggested ways to look for this “Shadow Biosphere” that are just completely fascinating. So fascinating, in fact, that I devote a whole article to it elsewhere here on timeblimp.com. Now, getting back to communication with aliens — there’s no escaping some disappointment, after you ponder the Fermi Paradox, that the universe seems eerily silent. (Hey, I think I know how Davies got the name for this book…) But try to temper your disappointment, you sniveling weasel. Davies lays out his scientific assessments of how you’d actually go about communicating with another planet, and puts forth reasons why we just may not be listening attentively enough. It could be that the alien signals are not yet in our technological power to observe. For example, current SETI programs scour the skies for telltale radio signals broadcasted from other planets. But should we be looking for some dramatic, high-energy signal emanating from alien civilizations? After all, our emissions have gotten *fainter* as our technology has increased. For a while, we were getting all of our TV from signals broadcasted by gigantic antennas, which also happen to broadcast straight out into space. Earth is surrounded by a bubble of ever-expanding TV and radio broadcasts, expanding by 1 light year for every year since they were broadcast. (for example, I Love Lucy is now sixty-something light years away.) But what has happened in the last few decades? We now send those signals down into cables in the earth, instead of broadcasting to space — that’s more energy efficient. Extrapolate this by millions of years, and we’d likely be using very energy-efficient means of communication, means that might not even be perceptible to the uninitiated. Instead of expecting to see some blatant signature such as giant electromagnetic emissions illuminating the galaxy, perhaps we should expect the aliens to be more energy-conscious than ourselves. A schematic of the JPEG encoding algorithm. Ironically, represented in a gif image. Furthermore, can we reasonably expect to become pen-pals with some alien civilization across the galaxy? Forget interstellar travel — even interstellar communication is too slow to really carry on a two-way conversation in the lifetime of a typical life form. We’re some of the longest-lived organisms on our planet, and we’d die long before completing a back-and-forth conversation with any civilization out of our extremely local neighborhood. A much more practical goal would be to send out autonomous probes / devices that are never designed to report back home. They could be programmed to say “hi” to whomever they come across during their one-way trip around the universe. A civilzation could send out a fleet of these little bots to explore the universe, without expectation of getting any news back. These little autonomous bots could gather resources from the universe as they travel, repairing themselves or even self-replicating when possible. (If you’re planning this, remember to build in self-control mechanisms so you don’t unleash gray goo on the universe). The whole point would be the relatively modest goal of announcing “we’re out there somewhere” to other civilizations, rather than making direct contact. And what would be an efficient way to do this? Probably not some gangly robot with landing pods, rocket thrusters, and an on-board computer just starting to learn what you humans call “emotion”. You’d want to design your little bot to be hardy, self-sufficient, but not consume much in the way of resources. It’d be much more efficient to do the job microscopically. And you’d probably not want to cobble together sophisticated miniaturized electronics — better to use complex chemical materials that could self-organize into a probe, rather than some esoteric clockwork device that might break down. Yep, some little bag of complex molecules, a device made from chemicals not electronics, would probably be easier and more robust. In fact if you were to sit back and design this optimal trade-off of robustness and low power usage, you might wind up settling on what would look to our eyes to be a microbe! Specifically, Davies suggests you might design yourself a virus — a durable, self-contained, self-replicating microscopic machine that could survive the harsh trip through interstellar space. "Alien virus? Well, let's return the favor! With a computer virus that will implausibly be able to infect the alien computers. Yes, macintosh format..."
As I reach the end of this review, I see I’ve mainly just retold all my favorite bits of his book, in my more meandering style. Can you tell that I really enjoyed the book? Even though I didn’t really do any reviewing, per se? Well, so what if this is essentially just a fawning advertisement for this very cool book — if I can get you to read it, then my review-with-little-actual-reviewing-content a success. And while I’ve brought up a handful of my favorite cool concepts, I’ve only scratched the surface of the fascinating ideas he covers. I’ll give you just a taste of one more of these ideas, and in the process include a shameless plug for my future article I plan to write. As I mentioned earlier, Davies has inspired me to write a future article on bizarre alien communication (such as custom-designed viruses spewed forth across the universe). This led me to look up the famous Arecibo message, one of the few examples of us sending out a message from Earth. Scientists (including my personal crush Carl Sagan) cooked up a short graphic message (shown to the right) that we presume could tell distant intelligent life a little something about earth. We shot it into space as a radio-frequency signal back in the ’70′s, aiming for a spot tens of thousands of light-years away. Note the message contains a cute little pic of the radio telescope used to transmit the message, down there at the bottom in purple. My research led me to an astounding fact about this message, a fact that absolutely floored me when I read it. What could it be? Read my article on The Strangest Attempts Ever At Communicating With Aliens, for the answer! 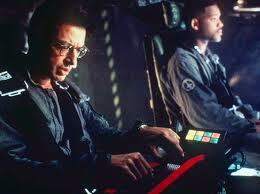 I’ll send it in a virus, which I will fire at you from a powerful radio telescope.